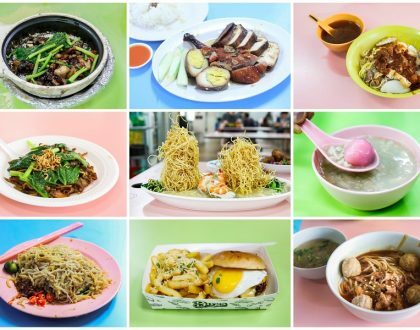 Tanjong Katong Road has been seldom talked about, yet a frequent haunt for many foodies in Singapore. 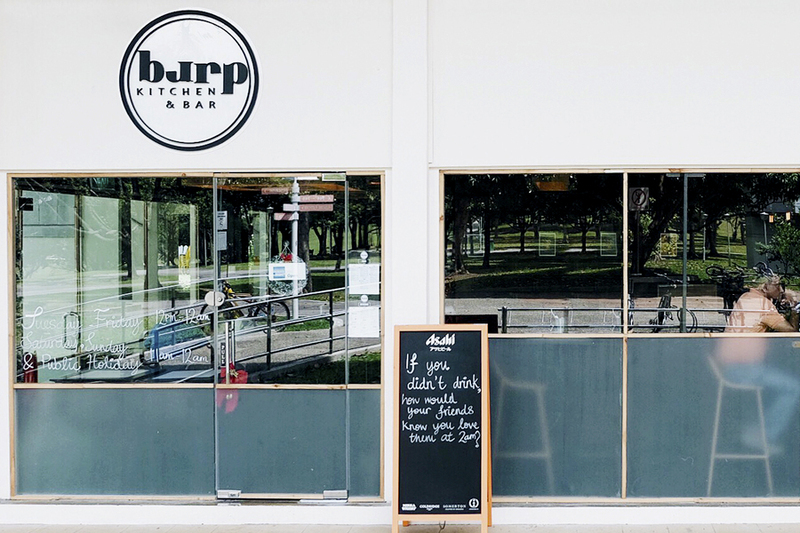 Burp Kitchen & Bar with its first outlet overlooking Bedok Reservoir (brunch with a view), has opened its 2nd at Tanjong Katong Road. It has been a while since I last came here for a dinner outing, but food continues to be exciting. 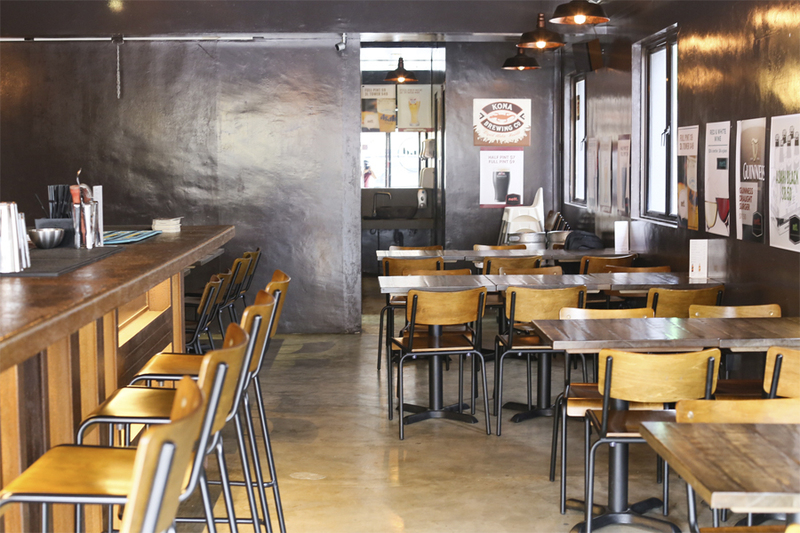 Over at Burp, the menu is focused on Americanised comfort food, with Asian-inspired and Tex-Mex fusion dishes. Complete with rustic décor and friendly service. 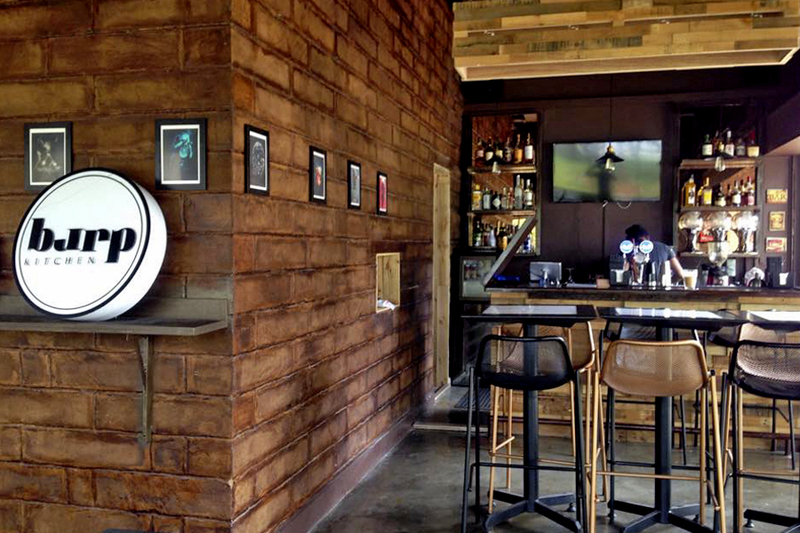 This can be considered a place to hang out with friends for dinner and after-work drinks. This is especially when their cocktails, mocktails and bottled craft beers are priced inexpensively. All their prices are NETT. No GST, no service charge. 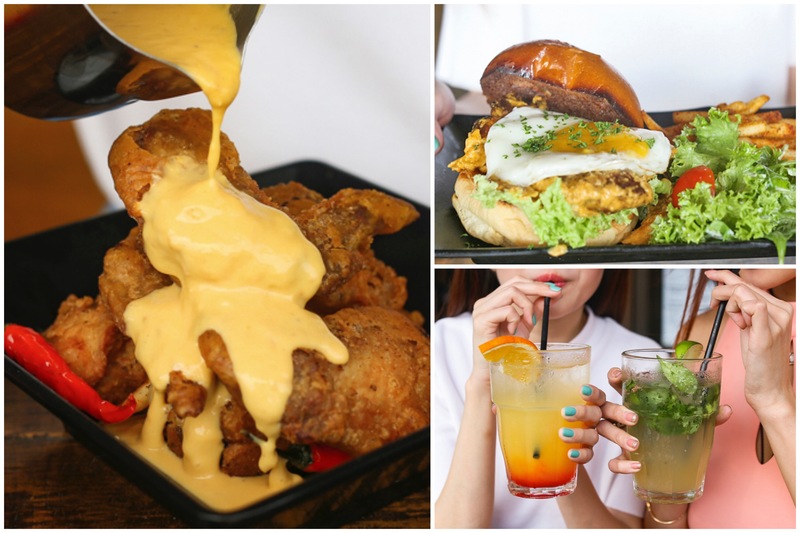 You can have a go for some comforting bar grub of Salted Egg Wings, Wanton Poppers, and Prawn Paste Popcorn Chicken; or have a dinner meal of Truffle Mushroom Carbonara, Chicken Mushroom Tom Yum Linguine, Triple Cheese Burger and Beef Bulgogi Tacos. 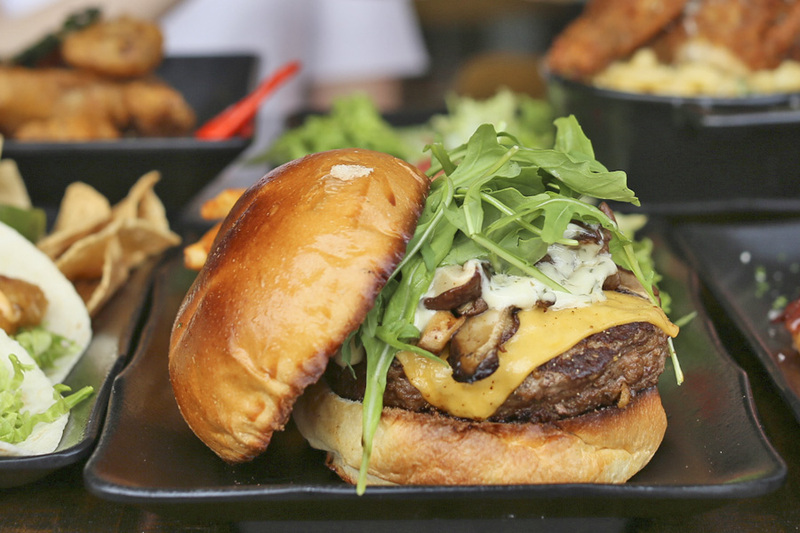 The burgers are worth a go here – these are big, juicy ones. 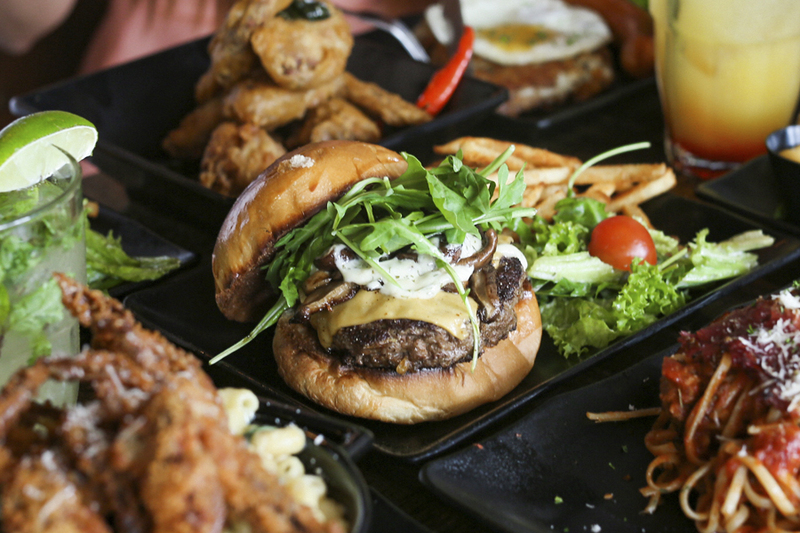 I particularly enjoyed the Beefy Shrooms Burger with the seared beef patty with rich hearty flavours, topped with savoury sautéed mushrooms. The ingredients were held together well in a soft brioche bun, and the addition of truffle mayo added some aroma as you bring it closer to your nose. Burger with a local flavour. 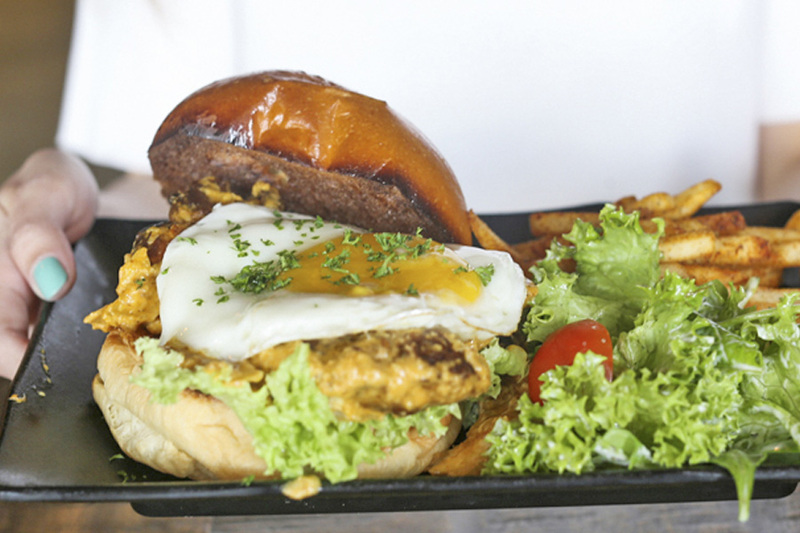 This comes with succulent chicken thigh drizzled over with rendang sauce – which is more nutty than spicy, along with sunny side up in a brioche bun. The slight ‘warning’ here that this may get messy to eat. So I say leave the cutting aside, and just chomp it down. 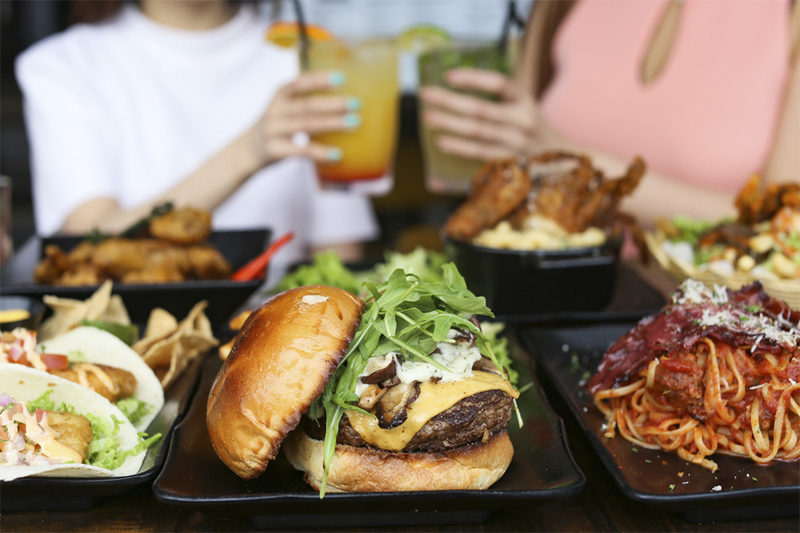 Other Burp burgers to choose from include BBQ Pork ($16), The Hog ($15) with pork patty and bacon, Burf’s Beef ($15), Triple Cheese ($16), Tom Yum Chicken ($14), Portobello ($14), Tofu ($12), and Soft Shell Crab ($18). Tacos were recommended to be the best selling items here, because they make a perfect match with drinks to wind the day down. There are options of fillings from Citrus Miso Tofu ($10), Beef Bulgogi ($12), Chicken Satay ($12), Baja Fish ($12), Grilled Shrimp ($12), to Pork Carnitas ($12) which is slow cooked BBQ pulled pork (sounds good). 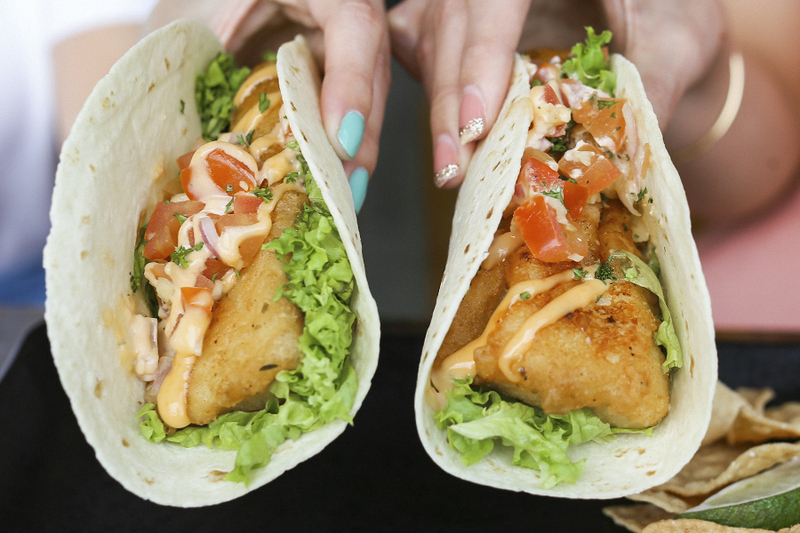 Get the Baja Fish Tacos, of crispy battered fish tucked into flour tortillas, lettuce and refreshing chopped tomatoes and onions of salsa fresca, drizzled with some spicy mayo. Remember to squeeze some lime over. 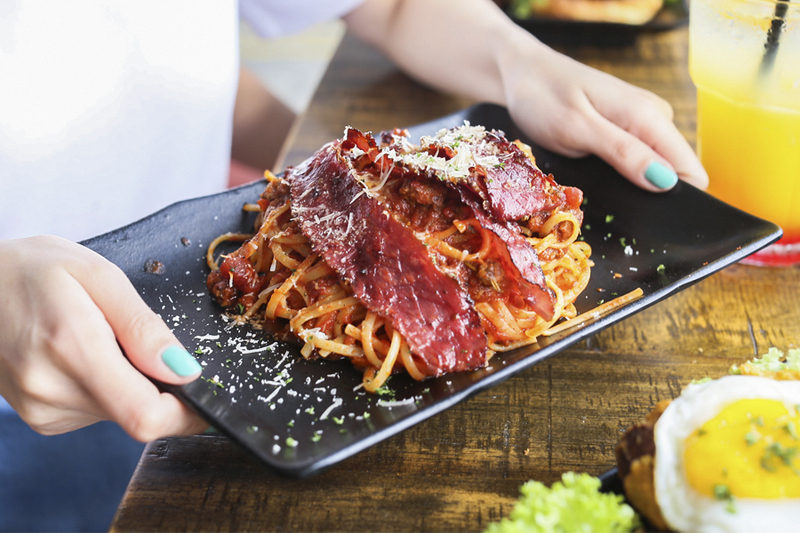 For a hearty pasta dish, I liked that the Beef Pastrami Marina had beef done in two ways for more layered taste – one as minced beef cooked in the tangy marinara sauce; the other was slices of beef pastrami over the linguine for some smoky flavours. An interesting combination. 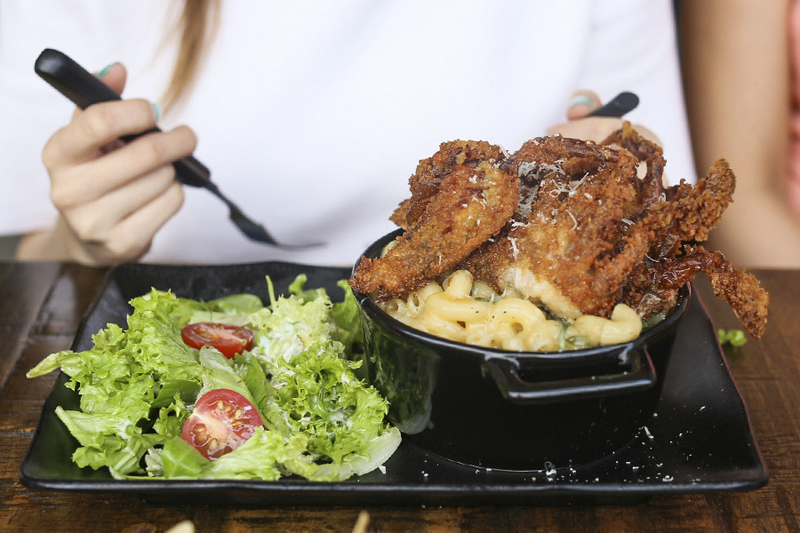 Creamy macaroni with triple cheeses of cheddar, mozzarella and parmesan, topped with deep fried soft shell crab. 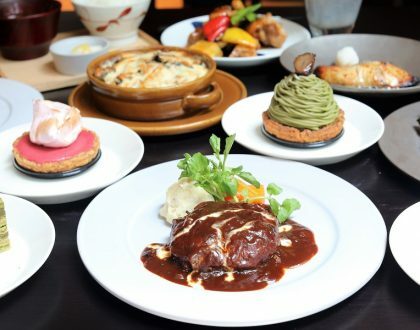 The server also mentioned that as there are many meat-free eaters around, you can also request for a version without the seafood, or get the popular Truffle Mac & Cheese ($10). 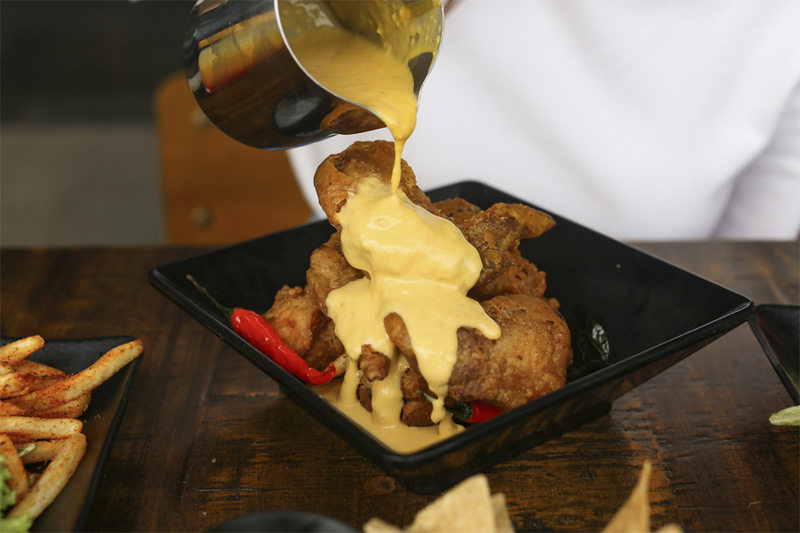 The table’s favourite dish just had to go to crispy wings drizzled over with in-house salted egg sauce which had that bit of grainy texture. My tip: just get your hands dirty on this. 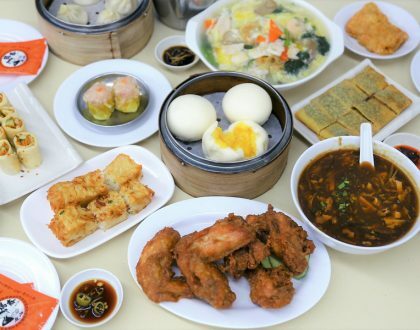 For fans of har cheong kai but lazy with the bones, this is the version for you. You get your crispy nibbles and that familiar distinct taste of the prawn paste. 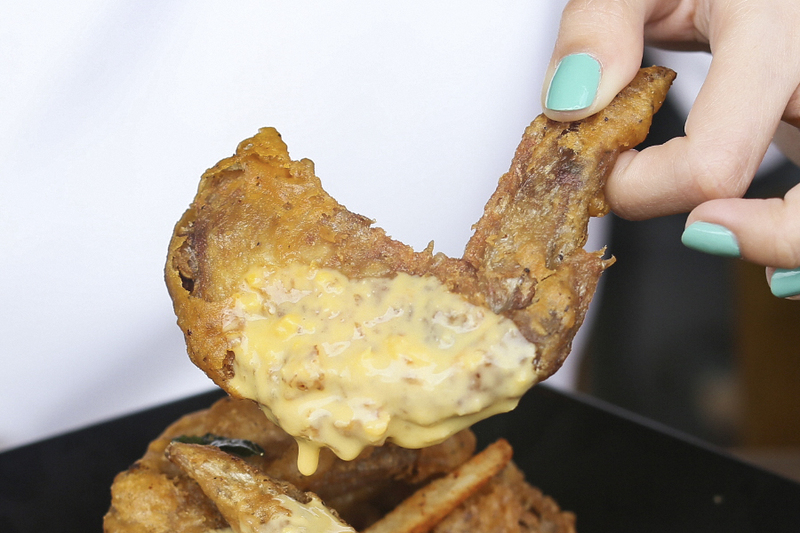 Between all the bar grub, we just couldn’t stop our hands from reaching out for the fries. I think you can treat this like a nibble by munching on the shoestring, or really treat this as a full-meal because the meat given was quite substantial. Loved the tanginess of the kimchi, and abundant pieces of marinated grilled beef. Brunch starts at 12pm during the weekends, for newly launched items of Omelette & Toast ($12), Grilled Cheese Sandwich ($15), Breakfast Rosti ($15), and Breakfast Waffles ($12) with scrambled eggs and bacon over Belgian waffles. 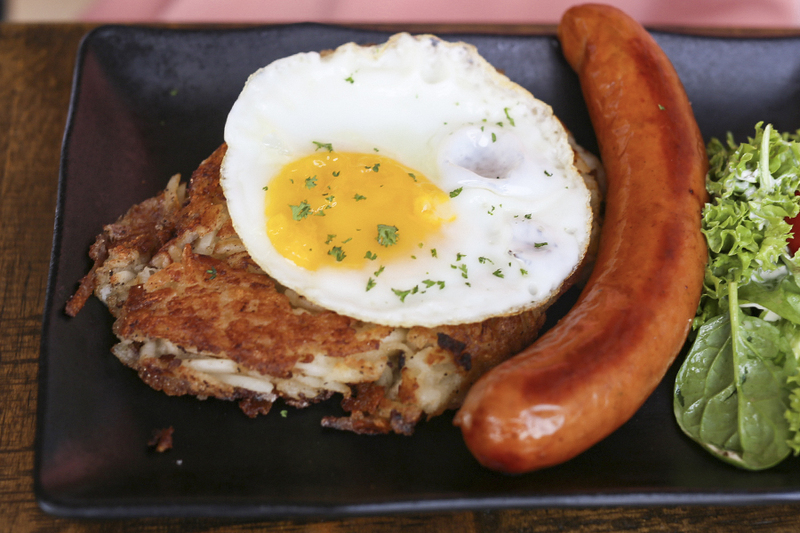 Rosti with a jumbo sausage and sunny side egg, is always a good idea to start the weekends right. 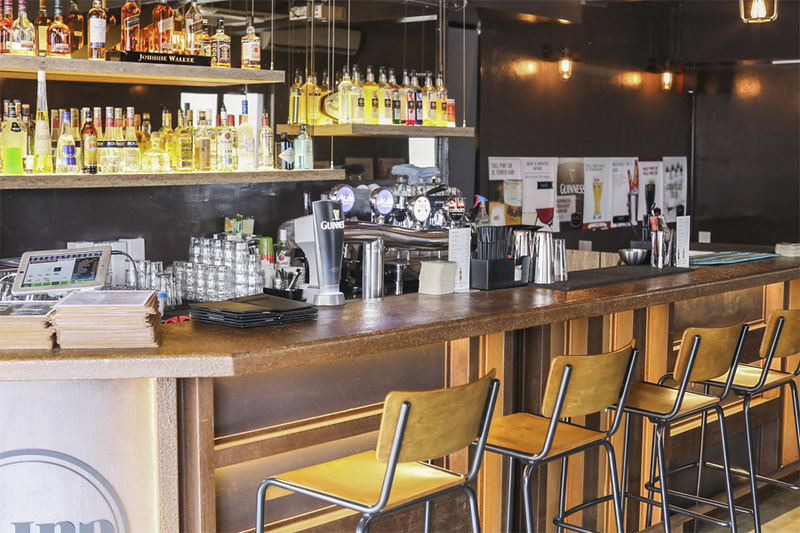 The beverage menu is extensive with cocktails, bottled craft beers and coffee alongside ice cold beers available on tap. Also at affordable prices. A pint of beer is $9 and a 3L tower is $49; bucket of 5 bottled beers is $30; bottled craft beers start from $9; and you can enjoy a glass of wine for only $8. 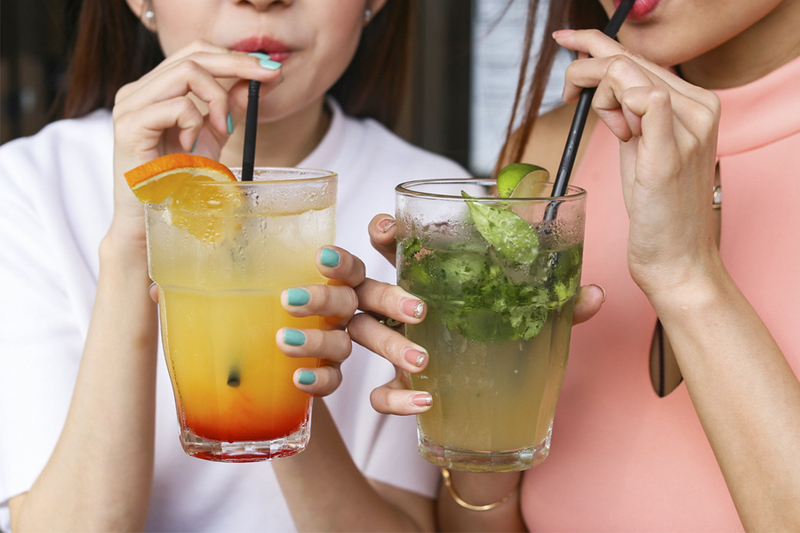 If alcohol is not your thing, the Mocktails of Mango Tango ($4.50, Pina Colada ($4.50), Shirley Temple ($4.50) and Virgin Mojito ($5) are a refreshing treat, without leaving a hole in your wallet. Reminder that all prices are NETT. 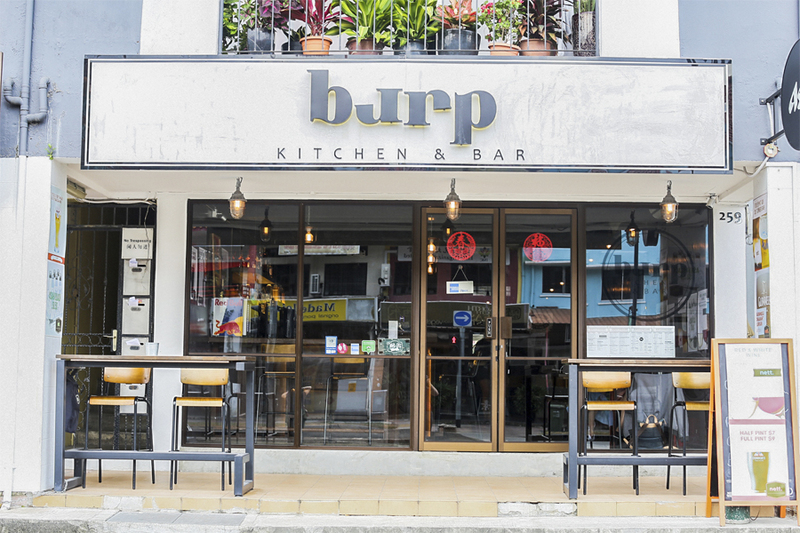 * This entry is brought to you in partnership with Burp Kitchen & Bar. i live close by this place, and I’ll never eat there as you can see the kitchen from the alley out back and it looks filthy….